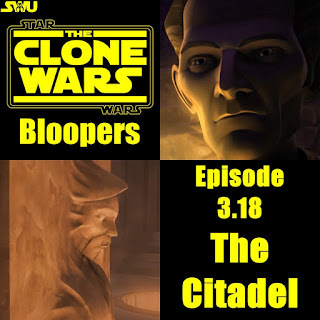 Clone Wars Bloopers: Ep. 3.18 "The Citadel"
YAY! 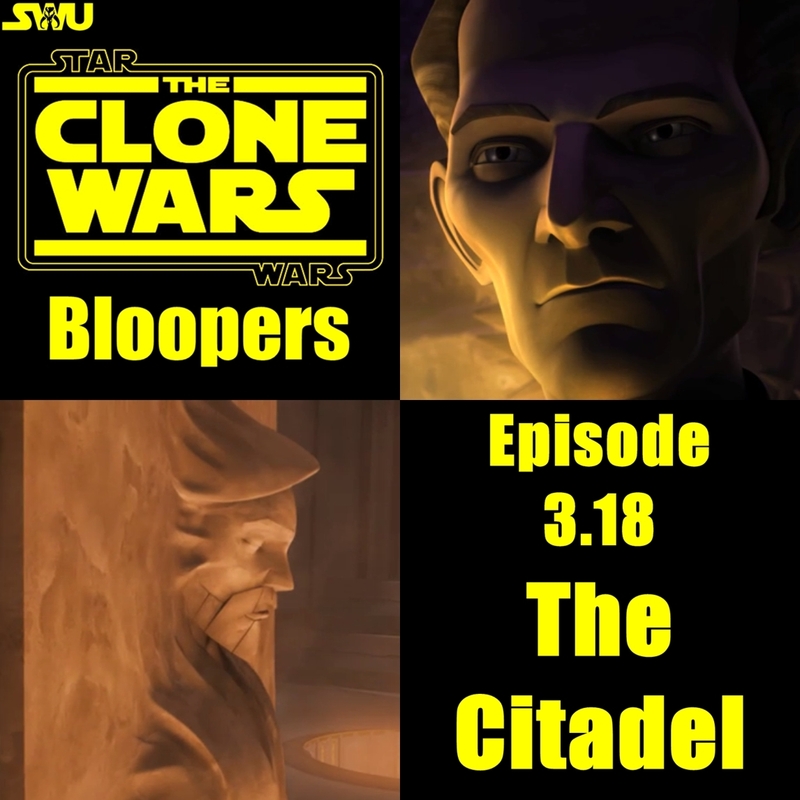 The Clone Wars crew has made more mistakes, which means more Clone Wars Bloopers! This episode was light on bloopers but at least they gave us something to talk about. Due to his sleeves and the intensity of the the force field around him it's hard to tell if they're actually there or the Clone Wars crew neglected to add them. In my opinion, it's a blooper but see for yourself. Next, When Anakin first views the Electro-mines in his Electrobinoculars there is no lightning. But when they start climbing up the wall there's lightning everywhere. Did someone forget to to turn the power on? Next, Anakin slices through the door of Tarkin's cell leaving a hole. Yet later when Sobeck and the droids arrive the hole is gone. A few hours after this episode aired, the episode guide on StarWars.com was updated to include the writer, director and cast credits. Take a look below and you'll see what I'm getting at. The cast credits above are obviously from the previous episode Ghosts of Mortis. This was fixed not long after, but what's even crazier is that later(below) the original air date is still shown as Monday, February 14th when we all know it aired Friday the 18th. Besides it's minor quirks this episode was not disappointing in the least. 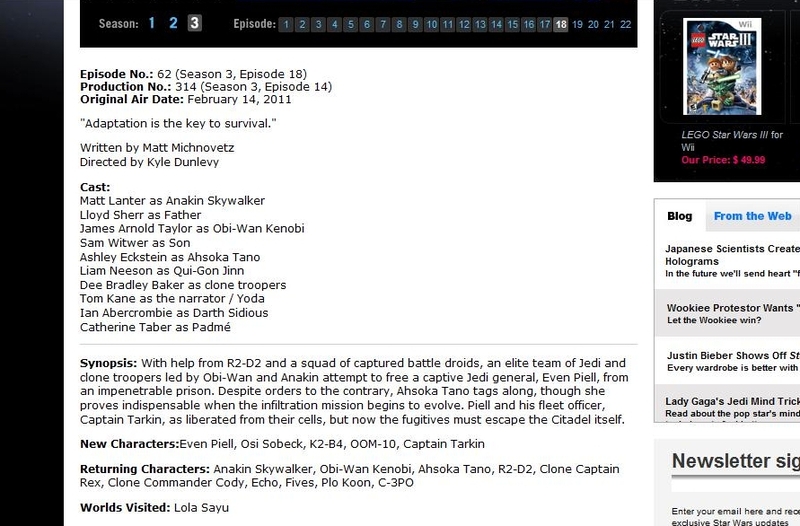 I loved the additions of Tarkin and Evan Peill. 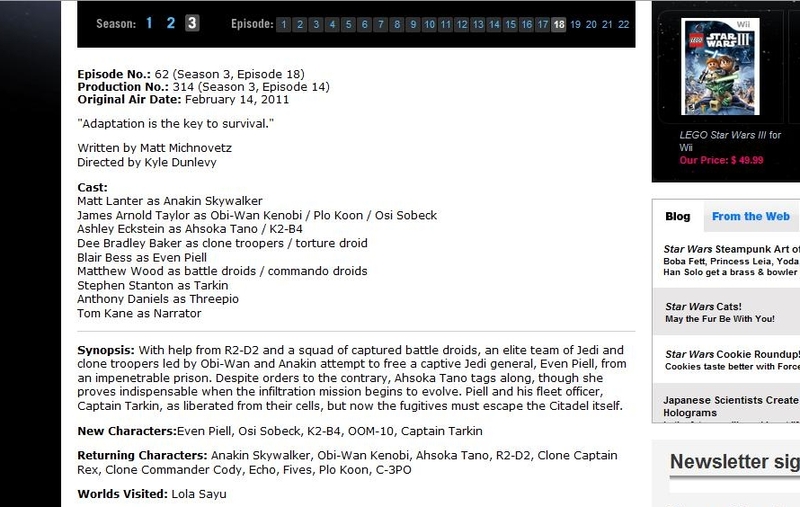 Bringing a minor prequel trilogy character and a major villain of the original films onto the show in the same episode was a great dynamic. Seeing Anakin and Tarkin meet for the first time was really freaky. There hasn't been too many scenes in TCW prior to this that have been this important, not just to the Saga, but the specifically the original Star Wars film. The prison warden, Osi Sobeck is a decent character, he never really caught on with me. No offense to James Arnold Taylor but Christopher Walken's voice just doesn't fit this character. I think he could have been better overall but we still have two more episodes so my opinion could change. It took me some time to get over the whole Carbon freezing thing. I didn't think Anakin could have any contact with Carbonite, nor himself be frozen in it, due to his dealings with it in "The Empire Strikes Back" but I guess I was wrong. 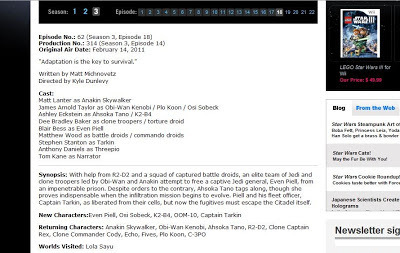 I'm glad Dave Filoni addressed it in his episode commentary. All in all I give this episode an 8/10 not my favorite but still very well done.